In the beginning of December I challenged myself and went on a low-carb diet for a week in an effort to lose some weight before Christmas. Oh boy, what a challenge this was. I had no bread, porridge, muesli, pasta or rice for a week! I introduced beans to my diet, something that I would normally not have as I never liked beans when I was a child. But beans are really healthy foods, high in protein and containing much less carbs than lentils. I am now slowly introducing them to my diet, slowly learning to like them. One evening during my low-carb week I made a kidney bean-vegetable soup made of various vegetables that I needed to use. I couldn’t use lentils as they are high in carbs so I used kidney beans instead. 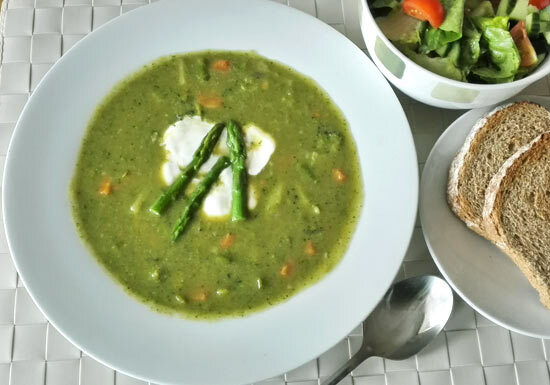 I wasn’t sure how it was going to turn out as I just put some random vegetables in the soup, but at the end it turned out delicious. I really liked it and I also had it for my lunch at work the next day. It was such a filling soup, it kept me going for a while. 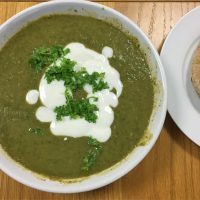 I made this soup the second time a week or so later and it wasn’t as tasty but then I realised why the first time was so delicious. You need to use some of the liquid from the beans – don’t drain the beans and throw the thick liquid away – use it for the soup. This makes it much more tasty. I did use half of a carrot in my soup (only because I had to use it up) but those who really want to be strict with their low carb diet can leave this out. Heat up the oil in a medium size saucepan, add sliced onion and gently fry it until soft. Add chopped garlic, quickly stir, leave for around 30 seconds so it releases the flavour and then add some water to prevent it from burning. Cook the harder vegetables first. Add cut celery, carrots and green beans to the pan and then add enough water to cover them so they can cook in a liquid. Add a stock cube, smoked paprika and bay leaves at the same time. Simmer vegetables for around 5 minutes and then add chopped courgette and passata. Add more water if needed. Cook for a few more minutes and then add the spinach. After the spinach has wilted a bit add a carton of kidney beans. If it feels it needs more liquid, add all of the liquid from the carton. If it's a bit watery, add only some of the liquid. Cook on a low heat for a few more minutes. If it's too watery you could add some flour and water mix. If you eat meat, you could also put some chicken pieces in this soup, just make sure the chicken is organic. Of course you would have to cook it first before cooking any vegetables. 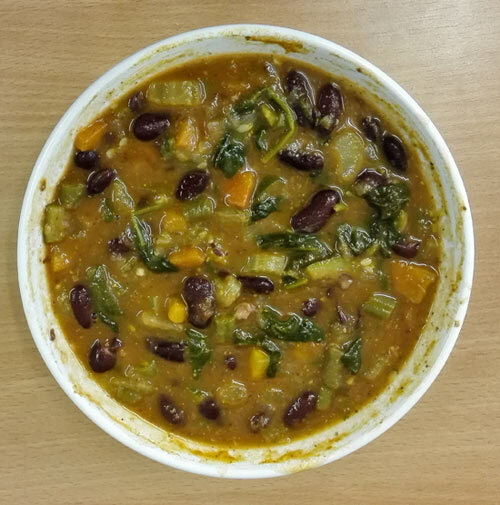 Hello, this soup looks delicious but can you tell me please what is the weight of the “carton” of beans as I live in the USA so don’t have access to tesco! I would like to get the portion ratio correct. Sorry about that! The drained weight is 230g but with liquid is 380g. If you try it I hope it turns out delicious..